Thanks, Chlo?, for helping with the posters!! Oliver was invited to give a talk at ARTSCHOOL/UK and have a panel discussion with the conceptual artist and painter Michael Craig-Martin about notions of artschool and experiences and politics of education. As all the flights were canceled due to the Islandic volcano activities and the ash cloud, we set up the talk via notorious SKYPE, and succeeded - and failed, in equal measures - in engaging in an interesting dialogue about our thoughts. 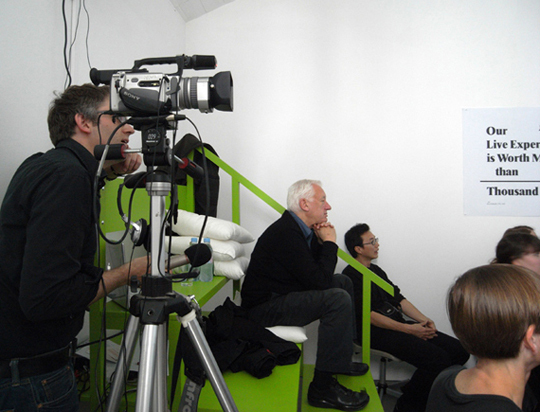 Oliver broadcasted from the Leipzig Academy of Visual Arts. The poster accompanying the talk referenced the Hornsey College of Art demonstrations and sit-in in 1968 and the subsequent 1969 ITN-TV-documentary by John Goldsmith.